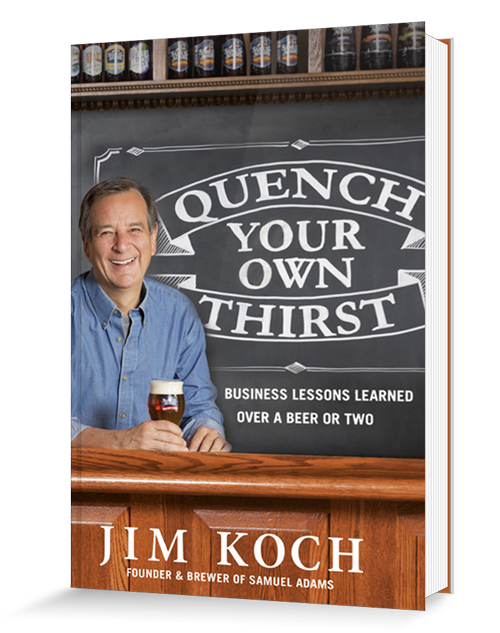 Boston, September 28, 2015 — Jim Koch, the founder of The Boston Beer Company, brewer of Samuel Adams beers, and a key catalyst in the American craft beer revolution, is writing a book titled QUENCH YOUR OWN THIRST: BUSINESS LESSONS LEARNED OVER A BEER OR TWO. Based on more than thirty years of experience as a business owner and brewer, Koch offers unprecedented insights into the whirlwind ride from scrappy start-up to thriving public company. His innovative business model and refreshingly frank stories offer counterintuitive lessons that entrepreneurs and drinkers can apply to business and to life. 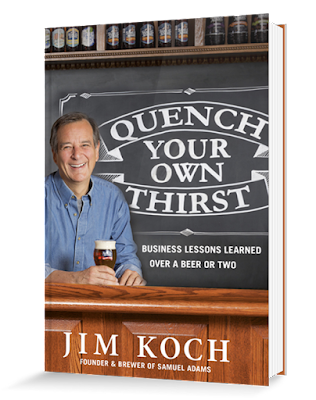 Koch’s anecdotes, quirky musings and bits of wisdom go far beyond brewing, and QUENCH YOUR OWN THIRST provides surprising advice on sales, marketing, hiring, and company culture. Koch narrates a fun, engaging guide for building a career or launching a successful business based on your passions and becoming successful while doing what you love. Bob Miller, president and publisher of Flatiron Books, and Will Schwalbe, executive vice president of editorial development and content innovation at Macmillan, in partnership with The Boston Beer Company, announced to beer lovers at the Great American Beer Festival that the Macmillan division will publish QUENCH YOUR OWN THIRST. "Jim is one of our generation's iconic entrepreneurs," observed Schwalbe. "I've been a huge fan (and by fan, I mean drinker) of Samuel Adams. But until I met Jim, I had no idea what an unorthodox thinker he is. As someone passionately interested in business and beer, I was totally fascinated listening to Jim talk about the early days of the American craft beer movement and about the trials of starting a new business. This book gives everyone the opportunity I had to share a beer with one of the most original business minds of our time. Reading Quench Your Own Thirst is like having a great tavern chat, with lessons in business that read like a conversation shared over a pint or two with an adventuresome friend." The World Exclusive rights to the book, which will be published in April 2016, were negotiated through Jim Levine at the Levine Greenberg Rostan Literary Agency who represented the author. Flatiron Books is a division of Macmillan. For more information please contact Flatiron Books Senior Publicist Steven Boriack at (646) 307-5163/steven.boriack@flatironbooks.com and visit www.quenchyourownthirst.com. Macmillan Publishers is a global trade publishing company, owned by Verlagsgruppe Georg von Holtzbrinck, with imprints in the United States, Germany, the United Kingdom, Australia, South Africa, and around the world. U.S. publishers include Farrar, Straus and Giroux; Flatiron Books; Henry Holt and Company; Picador; St. Martin’s Press; Tor/Forge; Macmillan Audio; and Macmillan Children’s Publishing Group. Macmillan Publishers is based in New York City, with many of our publishers located in the historic Flatiron Building. Jim Koch is the founder of The Boston Beer Company and brewer of Samuel Adams beers. He founded the company in 1984 using his great-great grandfather's recipe and helped revolutionize the American beer industry. Samuel Adams Boston Lager helped pave the way for the craft brewing movement, bringing rich, full-flavored beer to the American beer landscape. Today, The Boston Beer Company brews more than 60 styles of beer, relentlessly pursuing the development of new styles and the perfection of classic beers. With Jim at the helm for more than 30 years, The Boston Beer Company has become one of the largest American craft breweries but still only accounts for one percent of the U.S. beer market. Motivated by his own challenges starting a business, Jim launched the Samuel Adams Brewing the American Dream program in 2008. With a focus on helping small business owners in food, beverage, hospitality, and craft brewing, the program provides micro-loans as well as nation-wide speed coaching events that pair owners with Samuel Adams employees and local business professionals who provide real-world advice based on their areas of expertise. Jim currently serves as Chairman and was the company’s Chief Executive Officer until January 2001. Prior to starting The Boston Beer Company, he was a manufacturing consultant for The Boston Consulting Group and taught adventure skills for Outward Bound. Jim received an undergraduate as well as advanced degrees in Business and Law from Harvard University.